To say football is dominating the airwaves right now would be a gross understatement. An epic Rose Bowl stole the show earlier this week, and now we are set for both the College Football Playoff finale and the NFL Playoffs. The Wild Card Round takes center stage on Saturday and Sunday, followed by Alabama vs. Georgia on Monday. Alabama (-5) vs. Georgia - Georgia outlasted Oklahoma 54-48 in the Rose Bowl's first-ever overtime for the program's biggest victory since it won the National Championship back in 1980. Alabama, on the other hand, is coming off what was little more than a practice session in a 24-6 snoozer of a Sugar Bowl. Over/Under 45 (-110) - The Bulldogs pinned 54 points on the Sooners (45 in regulation), but the Sooners' defense is well-documented garbage. Alabama's defense? Not garbage. At the same time, the Crimson Tide's offense is not at the same level as Baker Mayfield and company. Points will be at more of a premium. At least one defensive or special teams touchdown (+175) - Alabama had a kickoff return for a touchdown in its title-game win over Clemson two years ago before offense ruled the day when the Tigers got revenge last season. The Tide returned an INT for a TD in Monday's semifinal game. UGA boasts dynamic return man Mecole Hardman. Overtime (+650) - Georgia, of course, just played an overtime thriller against Oklahoma out in Pasadena, Calif. Alabama's last two title games against Clemson did not need an extra frame, but it is safe to say they were extremely competitive. 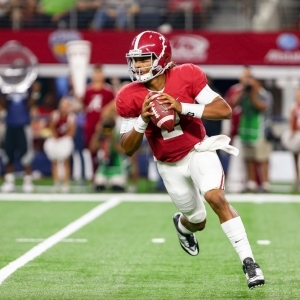 Although 'Bama is favored by five points, a nail-biting, hard-nosed, all-SEC battle is expected. Kansas City Chiefs ( -9) vs. Tennessee Titans - The Chiefs' 16-game slate was a tale of three different seasons within one. They started 5-0, lost six of their next seven games, and then reeled off four more wins in a row to go 10-6 and capture the AFC West title. The Titans snuck in at 9-7 for a rare playoff appearance. Jacksonville Jaguars (-9) vs. Buffalo Bills - As is often the case, all four home teams are favored in the wild-card round. All four are considerable favorites, too (all by at least 6.5 points). The Jaguars, who coasted to the AFC South crown in an underwhelming division, are the most heavily-favored of the lot against drought-ending Buffalo. Los Angeles Rams (-6.5) vs. Atlanta Falcons - Only one NFC team that made the playoffs last season is back, and it's defending conference champion Atlanta. But the offense that took the NFL by storm in 2017 is a shadow of its former self. Now it is Todd Gurley, Jared Goff, and the Rams who are putting up points at alarming rates. New Orleans Saints (-7) vs. Carolina Panthers - There was no doubt that an all-NFC South rivalry game would take place in round one. It looked like it would be NO vs. ATL, but that changed when the Saints lost at the last second to Tampa Bay. New Orleans went 2-0 in the regular season vs. the Panthers and outscored them by 31 points. New England Patriots (+215) - As usual, the AFC's road to the Super Bowl is going through Foxborough. The Patriots all but locked up the top seed with their controversial win over Pittsburgh, and they clinched it by taking care of the Jets last Sunday. At 40-years-old, Tom Brady is in line to be NFL MVP after leading NE to a 13-3 record. Minnesota Vikings (+400) - Minnesota is favored to become the first team in NFL history to play the Super Bowl in its own stadium. But the Vikings may not have home-field advantage the entire way because Philadelphia is the NFC's No. 1 seed. The Eagles, though, are obviously without Carson Wentz (torn ACL). Pittsburgh Steelers (+600) - The Steelers had every opportunity to secure the top seed before stumbling late against New England. They rested their top players in a competitive Week 17 victory over winless Cleveland, but not entirely by choice. Antonio Brown suffered a calf injury vs. the Patriots and is questionable for the playoffs. Los Angeles Rams (+1000) - The Rams are in the playoffs for the first time since 2004-05, when they lost to Atlanta in the divisional round. Now they get Atlanta again, this time with home-field advantage in L.A. Gurley is absolutely on fire, to the extent that is in the MVP discussion with Brady. New Orleans is also a +1000 fourth choice. Serena Williams (+375) - Serena has not played since…you guessed it…the Australian Open one year ago. She gave birth to a girl in early September, so more than four months will have elapsed since that life-changing occasion when she takes the court in Melbourne. The 36-year-old American is a seven-time champion Down Under. Garbine Muguruza (+600) - With less than two weeks to go until the season's first Grand Slam, the women's title appears to be relatively up for grabs as Serena goes in as somewhat of a question mark. Muguruza could be the one to capitalize, as the second-ranked Spaniard is already a two-time major winner at 24 years old. Simona Halep (+800) - Somehow, Halep has never captured a Grand Slam title. The 26-year-old Romanian has twice reached the French Open final, but she lost it again this past spring with a meltdown against underdog Jelena Ostapenko. Halep has dropped her opening match in Melbourne each of the last two seasons. Maria Sharapova (+900) - Sharapova returned from her one-year suspension last spring on clay before missing much of the summer due to injury. The Russian produced enough strong results to soar back well inside the top 100, earning direct entry into the Aussie Open-which she has won once. Karolina Pliskova is also a +900 fourth choice.